India’s federalism is indeed coming under stress in the era of coalition politics. The sharing of water and electricity is a highly contentious issue today. The good thing is that the activists who led the agitation against the Kudankulam Nuclear Power Project [KNPP] are on their last legs. Arguably, they are exhausted and somewhat demoralized by now and could be seeking a graceful exit from the agitation, but again they are raising demands that are unreasonable, especially that the inter-governmental agreement on KNPP should be brought into the public domain. The agitators haven’t probably learnt any lesson from their bitter experience that the rest of India has left them behind. Their demands are unlikely to be accepted; in any case, the Indian state concedes ground only under public pressure and in the heat of the moment. But the real bad part is that just as one agitation is fizzling out, another one may be brewing, which could be far more vicious. 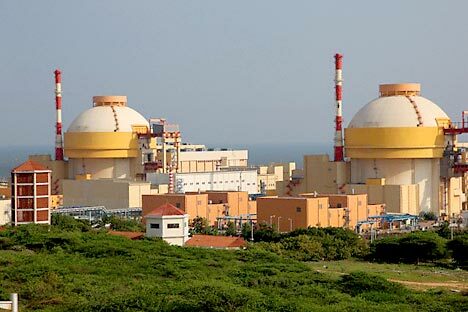 A political struggle between the two southern Indian states of Tamil Nadu and Kerala is erupting over the sharing of the power that is going to be generated at the KNPP even as the final clearance for the commissioning of the plant seems imminent. The struggle appears deceptively simple: Tamil Nadu wants the entire power generated at KNPP – 2000 MW electricity – while Kerala stakes its claim to 25 percent of it. Woven into it is the political prestige of Tamil Nadu chief minister Jayalalithaa who has written to Prime Minister Manmohan Singh. Enter coalition politics. Jayalalithaa is an attractive coalition partner in the fractious Indian political scene as the country lurches toward the 2014 parliamentary election, where she may garner a very substantial share of the 39 MPs that Tamil Nadu elects and might call the shots in government formation in New Delhi. The incumbent Congress-led government in New Delhi would be wary that she might use the ‘Kudankulam card’ at the election. Already, Congress is on the back foot in Tamil Nadu over the Sri Lankan Tamil issue and is barely surviving. But what complicates matters is that Kerala has a Congress-led government – a vanishing breed in state politics – and it has also staked its prestige over KNPP power sharing. The waters become really choppy if we taken into account the bad blood that currently prevails in the inter-state relations between Tamil Nadu and Kerala over the water-sharing and related issues of the Mullaperiyar dam. Simply put, Kerala harbors the grouse that Tamil Nadu is flexing muscles and throwing its weight around, bulldozing Kerala’s sensitivities (and perceived rights) about the safety of the dam. To be sure, Mullaperiyar is once again surging as a ‘hot’ issue in Kerala, with the potential to electrify the state’s highly combustible political atmosphere. India’s federalism is indeed coming under stress in the era of coalition politics. The sharing of water and electricity is a highly contentious issue today. In the absence of arbitration mechanisms that automatically click into action, it all becomes a political call. How the ‘power struggle’ over KNPP gets resolved will be a test case of the resilience and maturity of the political leadership at New Delhi, Chennai and Thiruvananthapuram. The silver lining, of course, is the growing acceptance of nuclear power in the public opinion as a solution to India’s energy security. Both Tamil Nadu and Kerala are on the same side here. That immensely helps the initiation of the work on KNPP 3 and 4 reactors.